I don’t know who created this, but it’s been doing the rounds on social networks this last week and makes me laugh every time. 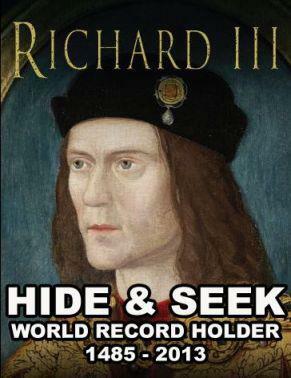 Unless you have been living under a rock (or should I say under a carpark) this past week, there’s a very good chance you will have heard of the discovery of the skeleton of Richard III, the last of the Plantagenet Kings of England, in Leicester. It has sparked fierce debate among historians, has started a battle over where the remains are to be kept (though it’s more than likely they’ll stay in Leicester), it’s been declared one of the greatest archaeological finds of our time, and it’s sure made me excited! The reason that many people are excited about this find, including myself, is because it could potentially rewrite a little bit of history. Richard III’s reputation has been tarnished since the moment he died, with historians accusing him of killing many people (including his two young nephews) to get to the throne. Much of the history we have of the man is written by the Tudors who were his immediate successors (and so naturally wanted to make him look bad to strengthen their position and right to be on the throne), and much of this history tends not to mention the important political reforms he introduced, such as the right to bail, and the idea of innocence until proven guilty. And roughly a century after his death, Shakespeare wrote a play about him in which the villainous portrayal was exaggerated greatly for the sake of drama – yet this of course has only further affirmed such views of the King in the eyes of most people. Some historians, or rather quite a lot of historians, are trying to quickly shut down the idea that anything at all is up for debate regarding the legacy of Richard III – the commonly asked question is, quite simply, how could a skeleton reveal anything new? It has revealed some things already – that he was not only weathered by battle at the time of his death, but was probably killed quite brutally. It also confirms a number of things regarding what happened to him after he died. But I think these historians who think there is nothing new to discover need to open their eyes up a little, and remember that history is not something that stays the same. The past itself cannot change, of course, but history is ultimately our understanding and perception of the past, and this can, does and should change regularly. And it doesn’t take much for it to shift – simply the renewed interest in this controversial monarch could help bring about a lot more research into his reign and character, and that alone could rewrite the books at least a little. We all know that old saying about how history is always written by the victorious – what we learn in history class at school is always from that one perspective of it, and even if we do learn from other perspectives it’s still very biased. I remember a big moment for me and my understanding of history came when it was pointed out to me that most of what we know about the Celts was written by the Romans, and so of course this is going to be biased against them and portray them as much more barbaric than they really were. It becomes more difficult the further back into the past you delve to find evidence to suggest differently to the current history of that period, but the general principle stays the same no matter what era you’re examining. And there’s a whole society and group of historians who are out to try and change the perspectives generally held about Richard III. The thing that excites me most about this is not just the sudden interest in this king or this period of history even, but the explosion of interest in history itself. It is rare that something like this makes the news at all, but this king’s skeleton really has people talking all over the world and the internet, and for me, for someone who loves history, this is simply awesome. What does the discovery of Richard III mean to you? Do you care about it at all? Do you think it’s important, and why/why not? It was never going to be very long before somebody made this joke. 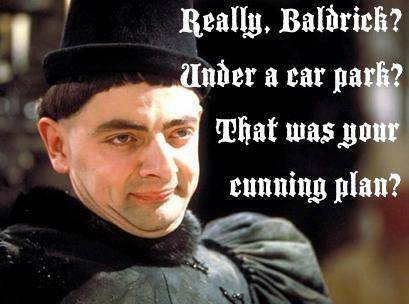 I need to re-watch this first series of Blackadder now.